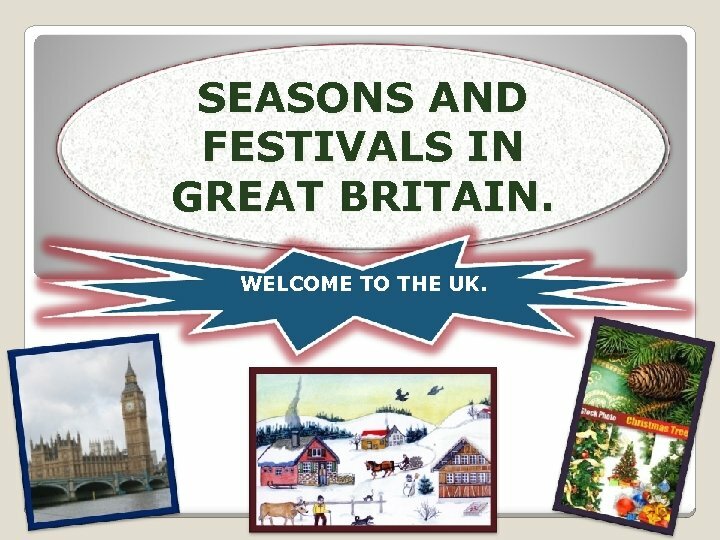 SEASONS AND FESTIVALS IN GREAT BRITAIN. WELCOME TO THE UK. The English Year. DO YOU KNOW ? 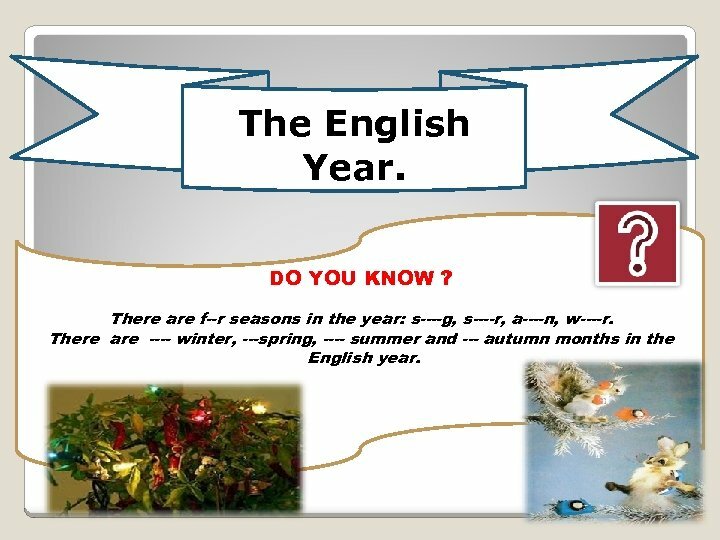 There are f--r seasons in the year: s----g, s----r, a----n, w----r. There are ---- winter, ---spring, ---- summer and --- autumn months in the English year. WINTER MONTHS IN GB The winter months in Great Britain are -------, ------- and ----. 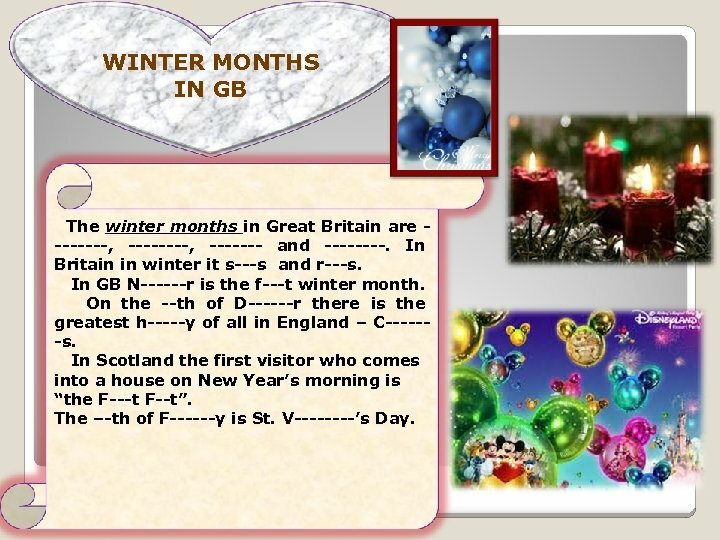 In Britain in winter it s---s and r---s. In GB N------r is the f---t winter month. On the --th of D------r there is the greatest h-----y of all in England – C------s. In Scotland the first visitor who comes into a house on New Year’s morning is “the F---t F--t”. The –-th of F------y is St. V----’s Day. SPRING MONTHS IN GREAT BRITAIN In Britain ----- and ----- are spring months. In England spring begins at the end of M---h. The 17 th of March is a national holiday in Ireland – St. P------’s D-y. On that day people wear a s------k. It is the national emblem of I-----d. April is the s----d spring month. In April or at the end of March English people celebrate E----r D-y. In England it is time to give and to get p------s. Pupils go back to school after E----r.
SUMMER MONTHS IN GREAT BRITAIN. 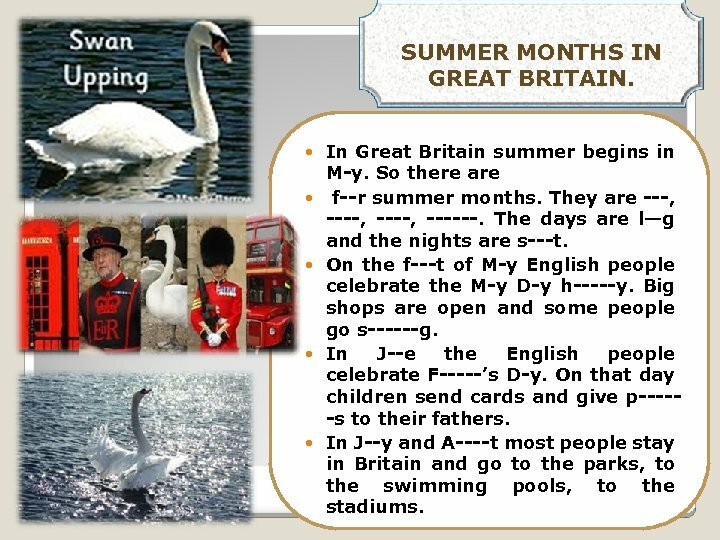 In Great Britain summer begins in M-y. So there are f--r summer months. They are ---, ----, ------. The days are l—g and the nights are s---t. On the f---t of M-y English people celebrate the M-y D-y h-----y. Big shops are open and some people go s------g. In J--e the English people celebrate F-----’s D-y. On that day children send cards and give p-----s to their fathers. In J--y and A----t most people stay in Britain and go to the parks, to the swimming pools, to the stadiums. Autumn months in Great Britain. In Britain autumn comes in S-------r. A----n is usually a nice s---n in England. It is w--m and d-y. But it can r—n a lot too. 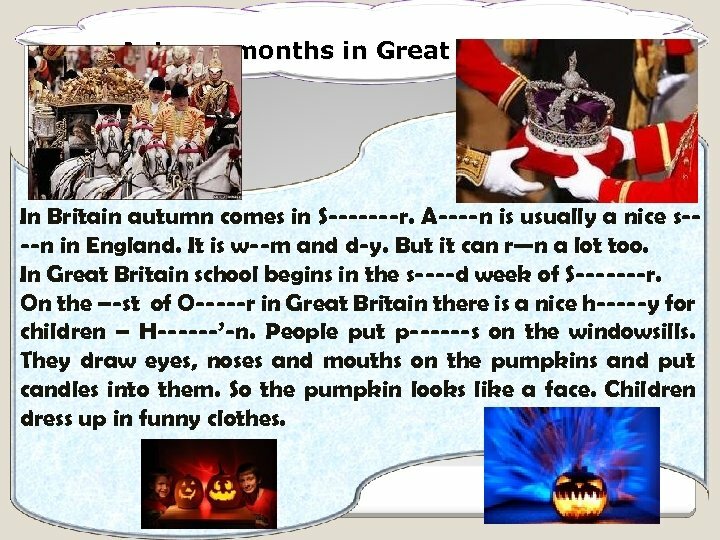 In Great Britain school begins in the s----d week of S-------r. On the –-st of O-----r in Great Britain there is a nice h-----y for children – H------’-n. People put p------s on the windowsills. They draw eyes, noses and mouths on the pumpkins and put candles into them. So the pumpkin looks like a face. Children dress up in funny clothes. 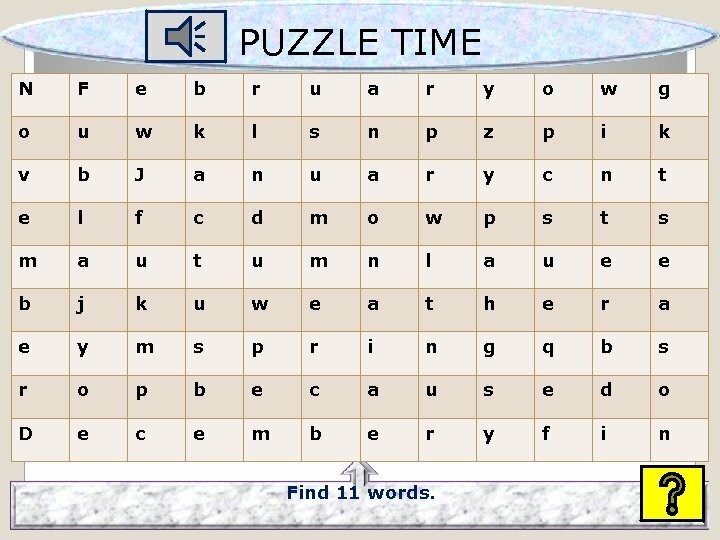 PUZZLE TIME N F e b r u a r y o w g o u w k l s n p z p i k v b J a n u a r y c n t e l f c d m o w p s t s m a u t u m n l a u e e b j k u w e a t h e r a e y m s p r i n g q b s r o p b e c a u s e d o D e c e m b e r y f i n Find 11 words.